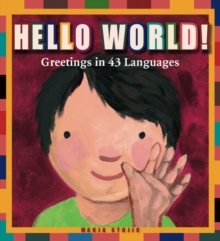 Children around the world say "hello" in their own languages, each and every day. Learn greetings in 43 languages from around the globe, from French to Swahili, and Urdu to Welsh. Each page includes a greeting in a different language, along with clear and simple phonetic spellings. Manja Stojic's warm and appealing paintings represent diverse children from all over the world. Hello World! promotes language learning and encourages young readers to understand and appreciate languages and cultures beyond their own.